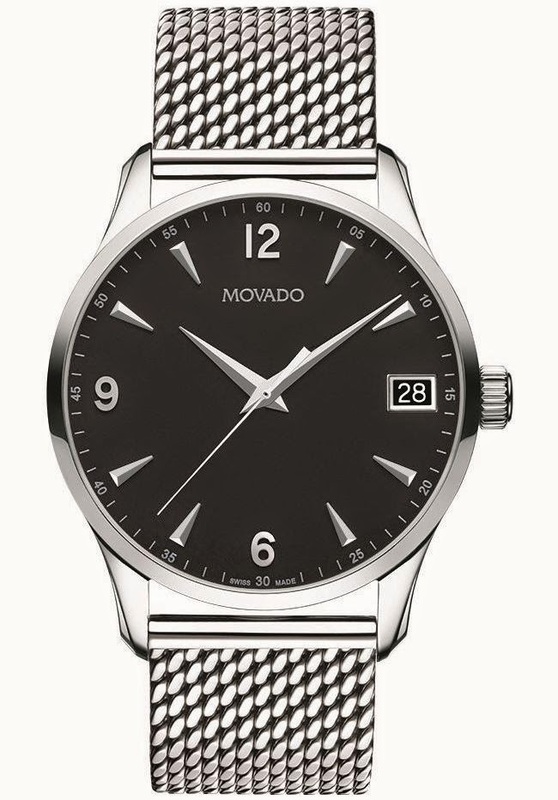 Movado Circa is a modern collection of precise Swiss quartz timepieces designed with a vintage-inspired look reminiscent of an earlier era. Launched in 2012, these handsome men’s watches and chronographs feature stainless steel cases with fluidly sculpted lugs, simple dials detailed by Arabic numerals or applied markers, and richly embossed glossy leather straps. 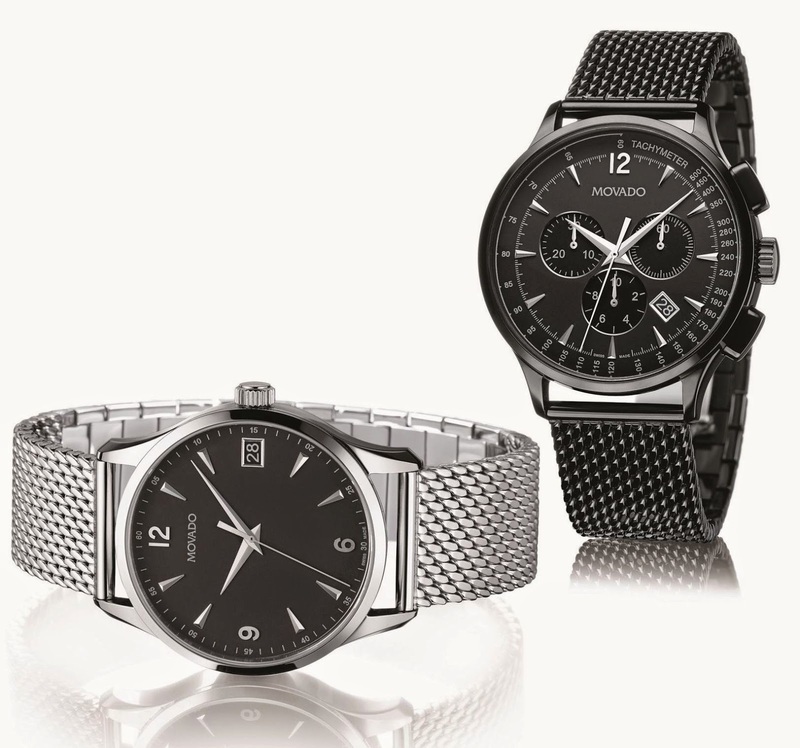 Now for 2014, Movado expands it’s Circa collection with two sophisticated new men’s models on mesh bracelets. These new bracelets are designed with mesh-textured removable back links and a butterfly deployment clasp to offer a smooth, seamless look with an adjustable fit. Crafted in polished stainless steel, the first style is a men’s dress watch with round 40mm case. It features a matte black powder-finish 3-hand dial elegantly detailed by applied silver-toned Arabic numerals and cone shaped markers, silver-toned dauphine hour/minute hands and printed Arabic minute index, and a date window at 3 o’clock. The polished intricate mesh-link bracelet imparts a seamless, flowing, thoroughly modern look. 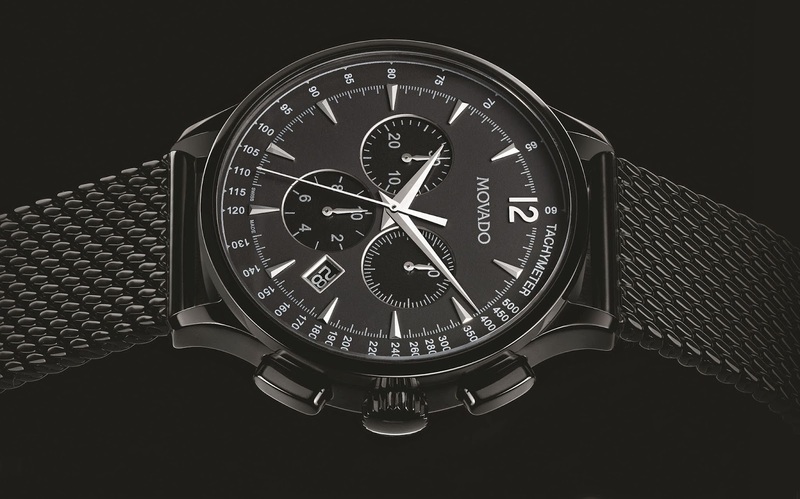 The second new model, a sport chronograph, is dramatically rendered in polished, all-black PVD-finished stainless steel. Its substantial 42mm case is equipped with two chronograph pushers. 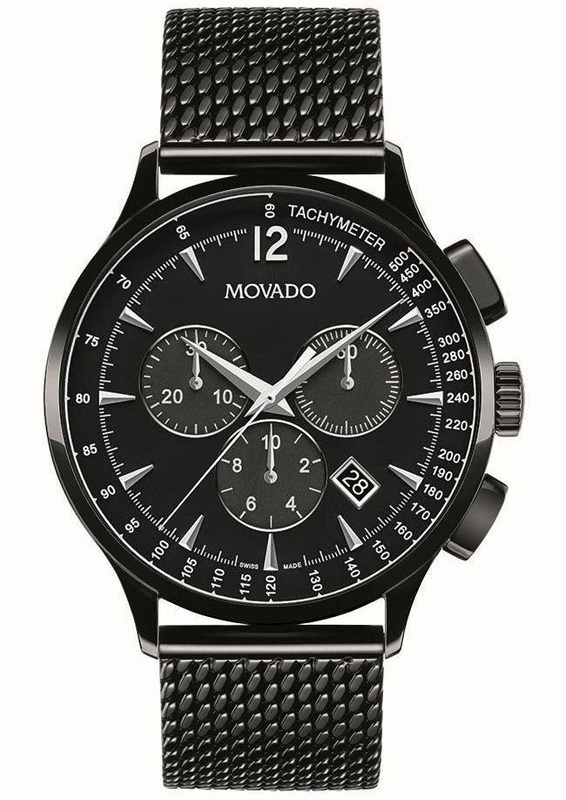 The black matte powder finish dial with tachymeter-scale reflector ring is defined by applied silver-toned cone-shaped markers and Arabic numeral at 12 o’clock, printed silver minute index, silver-toned dauphine hour and minute hands, and center mounted chronograph seconds hands, three black subdials with silver rings and markings – a small seconds hand at 2 o’clock, chronograph tenths-of-a-second counter at 6 o’clock, and chronograph 30-minute counter at 10 o’clock – and a square date display at 4 o’clock. These new Movado Circa mesh bracelet timepieces capture the essence of the collection’s distinctive design heritage with a fresh and modern look. Both models are water resistant to 3 ATM / 30 meters. – Round matte black powder-finish dials with silver-toned dauphine hour and minute hands: 3-hand with silver-toned cone-shaped markers/Arabic numerals at 12, 6, and 9 o’clock; printed silver Arabic minute index, and date display at 3 o’clock. – Chronograph with silver-printed black tachymeter reflector ring, applied silver-toned cone-shaped markers/ Arabic numeral at 12 o’clock; center-mounted silver-toned chronograph seconds hand; 3 silver-ringed black subdials – small seconds hand at 2 o’clock; chronograph tenths-of-a-second counter at 6 o’clock, chronograph 30-minutes counter at 10 o’clock – and date display at 4 o’clock.